This is a 200 bed General Hospital with 8 operating theatres. The complex includes besides the operating theatres, laboratories, Radiology Gynaecology and Intensive care units fully equipped with the requirements of a modern hospital. Along with the Hospital, Housing colony was also constructed all financed by His Highness Sheikh Khalifa Bin Zayed Al Nahyan, crown prince of Abu Dhabi & Deputy supreme commander of UAE, Armed forces. The cost of construction was USD 15.92 Million. 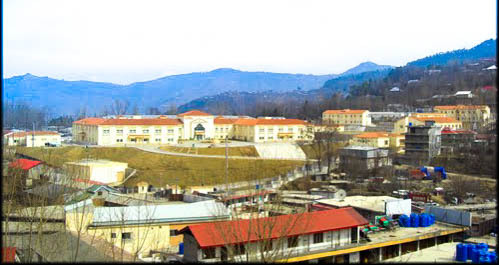 The construction of hospital started in April, 1996 and completed in March, 2003. AA was responsible for structural design and top supervision of the project.